Sodium overload stiffens vascular endothelial cells in vitro and promotes arterial hypertension in vivo. The hypothesis was tested that the endothelial glycocalyx (eGC), a mesh of anionic biopolymers covering the surface of the endothelium, participates in the stiffening process. By using a mechanical nanosensor, mounted on an atomic force microscope, height (∼400 nm) and stiffness (∼0.25 pN/nm) of the eGC on the luminal endothelial surface of split-open human umbilical arteries were quantified. In presence of aldosterone, the increase of extracellular sodium concentration from 135 to 150 mM over 5 days (sodium overload) led the eGC shrink by ∼50% and stiffening by ∼130%. Quantitative eGC analyses reveal that sodium overload caused a reduction of heparan sulphate residues by 68% which lead to destabilization and collapse of the eGC. Sodium overload transformed the endothelial cells from a sodium release into a sodium-absorbing state. Spironolactone, a specific aldosterone antagonist, prevented these changes. We conclude that the endothelial glycocalyx serves as an effective buffer barrier for sodium. Damaged eGC facilitates sodium entry into the endothelial cells. This could explain endothelial dysfunction and arterial hypertension observed in sodium abuse. In many populations worldwide, sodium chloride intake is in the range of 8 to 15 g per day. This amount contains 3.2 to 6 g/d of sodium which is far beyond human needs . There is evidence that sodium is osmotically inactively bound to negatively charged organic material . A potential candidate for such a dynamic sodium store is the glycocalyx (eGC) of blood vessels, which is a negatively charged mesh of membranous glycoproteins, proteoglycans, glycoaminoglycans and associated plasma proteins. Hyaluronic acid and the negatively charged heparan sulphate proteoglycans are its major constituents . eGC lacking hyaluron synthesis lose its vasoprotective function facilitating leukocyte adhesion, inflammation and atherosclerosis . Critical illnesses and major medical interventions can cause eGC shedding followed by severe endothelial dysfunction [6, 26, 32]. Sodium is reversibly bound to this viscoelastic polyelectrolyte  and transported via apical plasma membrane sodium channels (ENaC) into the cells, a mechanism mediated by aldosterone . Enhanced sodium influx, triggered by small increases in plasma sodium concentration, directly affects vascular endothelial cells leading to increased mechanical stiffness and reduced nitric oxide release . Initially, during sodium overload, i.e. when sodium intake exceeds the excretory capacity of the kidney, sodium is retained. Repeated recurrence of this process is considered to be one of the early steps in the pathogenesis of hypertension and cardiovascular disease . Alternatively, a persistent increase in the plasma level of aldosterone renders vascular endothelium stiff and vulnerable . Changes in mechanical stiffness do not necessarily affect the whole cell, often only the cell's periphery, its “shell” is involved [17, 18, 28]. This part of the cell is close to 1 μm thick and comprises the plasma membrane including the highly dynamic submembranous actin web. With atomic force microscopy (AFM), it is now possible to measure the mechanical properties of the cell's shell and to describe salt-specific alterations that occur only in this distinct portion of the cell . As a further step, the work at present has now switched to the soft and barely detectable eGC. Technical limitations were overcome so that the eGC could be quantified in terms of height and stiffness. To mimic physiological conditions, split-open arteries ex vivo were used for eGC stiffness measurements. The data indicate a possible role for the eGC in the maintenance of sodium homeostasis. For technical reasons we used endothelia from ex vivo arteries and two different cell lines. All preparations respond to mineralocorticoids [11, 19, 22]. In order to prevent a collapse of the eGC, we added to all experimental solutions at least 1% fetal calf serum. In culture media we usually used 20%. In all experiments a basal aldosterone concentration of 0.1 nM and, if appropriate, a spironolactone concentration of 100 nM were used. The preparation of an artery ex vivo obtained from a human umbilical cord is described in Fig. 1. The resected and split-open artery can be used for mechanical measurements as soon as it is tightly attached to the cell-Tak®-coated glass surface. The endothelial cell layer is well preserved in this preparation (over at least 1 week kept in culture) as indicated by immunostaining of VE-cadherin (Fig. 1, lower right). These endothelial cells are called human umbilical artery endothelial cells ex vivo (HUAEC). The mechanical properties of a similar ex vivo artery preparation have been described recently . Bovine aortic endothelial GM7373 cells (DSMZ, Braunschweig, Germany) were grown in culture as previously described . Briefly, confluent GM7373 cells  were cultured in T25 culture flasks using DMEM medium (Invitrogen Corp., Karlsruhe, Germany) with addition of NaHCO3, penicillin G, streptomycin (Biochrom AG, Berlin, Germany) and 20% fetal bovine serum (PAA Clone, Coelbe, Germany). After reaching confluence cells were split and then cultured on thin (diameter = 15 mm) glass coverslips. These were placed in petri dishes filled with culture medium with either low (135 mM) or high (150 mM) sodium. Osmolality was kept constant with appropriate addition of mannitol to the low-sodium medium. GM7373 cells formed confluent monolayers within 48 h (at 37°C, 5% CO2). For the HUAEC ex vivo preparation, the same culture media were used as described above. The EA.hy926 cell line, derived from endothelium of the human umbilical vein , was grown in DMEM medium containing 10% fetal calf serum (Biochrom AG). Intracellular sodium measurements were performed on confluent EA.hy926 cell layers seeded on glass bottom dishes (Willco Wells, Amsterdam, Netherlands) mounted to an inverted fluorescence microscope (Zeiss Axiovert 200, Jena, Germany) and equipped with a CCD camera (CoolSNAP; Visitron Systems, Munich, Germany). The AM-ester of the intracellular sodium probe SBFI (sodium-binding benzofuran isophthalate; Molecular Probes, Darmstadt, Germany) was dissolved in DMSO (5 mM) and mixed with an equal volume of 25% wt/vol Pluronic-127 dissolved in DMSO. Endothelial cell monolayers on glass were incubated with a final SBFI concentration of 0.01 mM in HEPES-buffered medium for at least 3 h at 4°C. For fluorescence measurements a 75-W Xenon light source and a 340/380-nm filter set was applied. After loading, EA.hy926 were perfused at room temperature for 30 min with dye-free HEPES buffer containing 5 mM glucose, 10 mM HEPES, 5 mM KCl, 1 mM CaCl2, 1 mM MgCl2, and 135 mM NaCl (low Na+) or 150 mM NaCl (high Na+), respectively. Then, cells were incubated in low or high Na+ solution containing Heparinase I (1 U/ml; Sigma-Aldrich Chemie GmbH, Steinheim, Germany) for 20 min, while fluorescence measurements were taken every 10 s. At the end of the experiment, intracellular calibration for sodium was performed as described previously . GM7373 cells were cultured as described above. After removal of the medium and washing twice with phosphate-buffered saline, 5.5 ml of HEPES-buffered saline [composition in mM: 140 NaCl, 5 KCl, 1 MgCl2, 1 CaCl2, and 10 HEPES (N-2-hydroxyethylpiperazine-N′-2-ethanesulfonic acid), pH 7.4] containing 0.5 U/ml heparinase I was added to the confluent cell monolayer (75 cm2) and incubated at 37°C. The culture flasks were placed on a shaker inside the (CO2 free) incubator and rhythmically shaken along the longitudinal axis of the flask (0.5 Hz) for 30 min. Low/high sodium (see above), aldosterone, spironolactone, amiloride, and the respective solvents were present in the different media as appropriate. After incubation the respective supernatants were harvested and centrifuged (134×g), and the pH titrated to 5.5 by means of 0.1 M HCl. This strategy was used to release as much sodium as possible from the binding sites of the heparan sulphate residues. Finally, sodium was measured by using an electrolyte analyzer (EML 105; Radiometer, Copenhagen). Aldosterone (d-aldosterone, Sigma-Aldrich) and spironolactone (Sigma-Aldrich) were dissolved in ethanol (1 mM stock solution, stored at 4°C). A concentration of 0.1 nM aldosterone and 100 nM spironolactone was used in the culture and perfusion media as appropriate. Amiloride (Sigma-Aldrich), a selective blocking chemical of the ENaC, was dissolved in water, at a final concentration of 10 μmol/l. Figure 2 schematically describes stiffness measurements in living vascular endothelium. The figure explains the method of “mechanical cell sectioning”, from the cell surface towards the cell interior. In a previous publication, we described stiffness measurements of the “bulk” cell membrane (including the glycocalyx, the plasma membrane and the cortical actin web) and the “bulk” cell . In the present study we did not measure bulk stiffnesses but instead exclusively focused on stiffness measurements of the outer surface layer of the endothelial cells, the eGC. 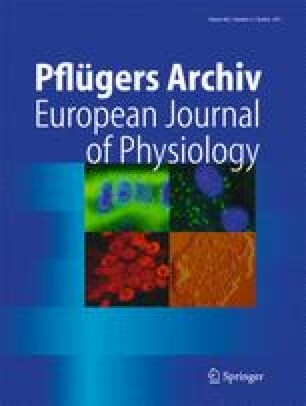 eGC stiffness of ex vivo arteries was determined with AFM techniques similar as described previously in detail for measuring the endothelial cell membrane/cortical web . The following modifications were necessary for eGC stiffness measurements: (1) low indentation velocity, 400 nm/s; (2) low loading force, about 200 pN; and (3) low indentation frequency, 0.2 Hz. AFM cantilevers (MLCT contact microlevers; spring constant, 0.01 N/m; Veeco, Mannheim, Germany) with colloidal tips (electrically uncharged polystyrene spheres, 1 μm in diameter) were applied . AFM measurements were performed at 37°C using a Multimode® AFM with a feedback-controlled heating device (Veeco). The artery preparation was bathed in HEPES-buffered solution [standard composition in millimolars: 135 NaCl, 5 KCl, 1 MgCl2, 1 CaCl2, 10 HEPES (N-2-hydroxyethylpiperazine-N′-2-ethanesulfonic acid), pH 7.4]. Fetal bovine serum (1%) was added in order to prevent eGC collapse [12, 35]. Sodium (135–150 mM) was varied as appropriate. Iso-osmolality was maintained by the addition of mannitol. Stiffness measurements and fluorescence microscopy on the endothelial glycocalyx were performed by an AFM (BioScope Catalyst, Bruker, Mannheim, Germany) combined with an inverted fluorescence microscope (DMI 6000 B; Leica Microsystems, Wetzlar, Germany). The mechanical and optical measurements were simultaneously performed on living cells in HEPES-buffered solution, containing 1% FCS (PAA Clone). For the AFM stiffness measurements soft cantilevers (spring constant = 18 pN/nm; Novascan, Ames, IA, USA) with spherical tips (sphere diameter = 1 μm) and maximal loading forces in the range of 400 pN were used. Heparan sulphate of the eGC was quantified by using a mouse anti-heparan sulphate (10E4 epitope) antibody (Seikagaku Corporation, Tokyo, Japan). As secondary antibody, QDot 655 goat anti-mouse antibody conjugate (Invitrogen, Darmstadt, Germany) was used. The primary antibody in the dilution of 1:500 was added to living GM7373 cells maintained in culture medium at 37°C. After incubation for 30 min, cells were washed 3 × 5 min with PBS (PAA Clone) at 37°C. Then the secondary QDot antibody conjugate was added (1:800). The cells were again incubated for 30 min and washed 3 × 5 min in PBS at 37°C. Then, PBS was exchanged by HEPES-buffered solution, containing 1% FCS (PAA Clone) and the measurement started immediately after this procedure. Quantitative fluorescence microscopy was performed. The QDots (i.e. fluorescent nanocrystals that virtually do not bleach) were excited with a 400-nm laser (emission wavelength, 655 nm). The number of bound QDots/area was quantified at ×100 magnification as previously described . The amount of stained heparan sulphate was quantified by counting single Qdots per area (about 5 to 10 cells per area). In order to account for any variations in cell height, two to four images at different focal planes per area were taken and the total amount of Qdots determined. The fluorescence data were processed with ImageJ, version 1.43U (freeware, http://rsbweb.nih.gov/ij/). Stiffness, height and heparan sulphate-bound QDots were quantified before and after addition of heparinase I (45 min incubation, 1 mU/ml). AFM raw data were processed with Punias 3D version 1.0 release 1.1 (http://punias.voila.net/). For graphical and statistical exploration, STATISTICA 8 (StatSoft Inc., Tulsa, USA) and OriginPro 8 (OriginLab Corporation, Northampton, USA) were used. EA.hy926 cells were seeded on ∅ 35 mm culture dishes with glass bottom (Wilco, Amsterdam, Netherlands) and grown for 5 days in low- and high-sodium medium (in presence of 0.1 nM aldosterone) until confluence was reached. Fluorescein-labelled U. europaeus agglutinin I (Vector Laboratories, Burlingame, USA) in a concentration of 0.01 mg/ml was added directly to the cell medium. After 10 min of incubation, cells were washed twice with HEPES-buffered (low sodium/high sodium + 0.1 nM aldosterone + 1% FCS) solution. For fluorescence, excitation wavelength of 494 nm was used; emission at 518 nm was measured. Fluorescence microscopy (excitation/emission wavelengths in nanometers, 494/518) was performed by a Leica DMI 6000 B inverted fluorescence microscope (×40 magnification; Leica Microsystems). The fluorescence data were processed with ImageJ (see above). In order to measure the stiffness of the extremely soft eGC, several experimental parameters had to be modified, in comparison to the standard nanoindentation procedures (described in methods). Figure 3 shows a representative force–distance curve. Two slopes can be detected, the first slope is shallow and the second slope is steep. As indicated above, the slopes directly reflect the regional (zonal) cell stiffnesses. Thus, there is a soft outer surface layer (indicated by the first slope), directly adjacent to a more stiff layer underneath. Figure 4 displays time-resolved data from a representative experiment in which heparinase was applied in order to biochemically characterize the first surface layer. Within minutes of heparinase treatment, the stiffness of the outer cell layer decreases by more than 50% indicating cleavage of heparan sulphate residues. At the same time, the glycocalyx thickness in this particular experiment drops from 400 to 200 nm, consistent with the view that a lack of heparan sulphate residues in this surface layer leads to a collapse of this structure. Taken together, this strongly suggests that the first mechanical resistivity which has to be overcome by the colloidal AFM tip during the indentation procedure most probably is the endothelial glycocalyx. To test the assumption that the indentation measurements indeed are able to disclose the eGC, we combined mechanical and fluorescence measurements in individual cells. Using a hybrid AFM fluorescence setup [4, 10], we measured stiffness/height of the soft surface layer and, simultaneously in the same cell, the amount of heparan sulphate using quantitative immunofluorescence. The measurements were performed before and 45 min after heparinase treatment. This approach allows the quantification of surface layer stiffness, height and heparan sulphate in individual cells (paired data). The data are displayed in Fig. 5. It is evident that heparinase treatment leads to a decrease of stiffness (47%), height (42%) and heparan sulphate (34%). The decrease of heparan sulphate significantly correlates with the decrease in stiffness (Spearman correlation coefficient = 0.72, p < 0.001) and height (correlation coefficient = 0.38, p < 0.001). Taken together the data strongly support the view that the soft endothelial surface layer, disclosed by the nanoindentation measurements, is indeed the eGC. The present study focuses on the mechanical stability of the eGC. Its mechanical stiffness is about 0.25 pN/nm which is 5 to 10 times smaller than the stiffness of the plasma membrane (including the submembrane actin web) . eGC stiffness strongly depends upon ambient sodium. eGC of endothelium, maintained in high-sodium conditions for 5 days, (sodium overload), hardens, and heparinase treatment is less effective (low sodium, 58% decrease in stiffness; high sodium, 35% decrease in stiffness). Spironolactone, a specific aldosterone antagonist added in the culture medium during the 5-day high-sodium incubation period, completely prevents the effects of sodium overload, i.e. the eGC remains soft and avidly responds to heparinase (Fig. 6). As indicated in Fig. 3, eGC height and stiffness can be taken from the force–distance curves of individual cells. These two parameters are plotted in Fig. 7. When the sodium concentration has been kept low in the culture medium for 5 days, eGC is found soft and prominent. In contrast, when the sodium concentration has been kept high for 5 days, the eGC hardens and flattens. Again, spironolactone prevents the high-sodium response of the eGC. Taken together, the data indicate that the eGC structure is severely altered when the endothelium is chronically exposed to ambient high sodium. To complement the AFM data and thus gaining more insight into any specific alterations of the glycocalyx, we quantified endothelial-specific lectin binding using fluorescence-labelled U. europaeus agglutinin I (UEA) and heparan sulphate residues using specific antibodies labelled with fluorescent quantum dots (nanocrystals). Two experimental series in cultured human endothelial cells (EAhy.926 cell line) were performed, one after low-sodium and one after high-sodium incubation (5 days of incubation). The data are shown in Fig. 8. There was a dramatic decrease of heparan sulphate fluorescence in cells incubated in ambient high sodium indicating a 68% decrease in the amount of heparan sulphate residues (Fig. 8, upper graph). This finding may explain the reduced response of eGC stiffness to heparinase as shown in Fig. 6. In contrast, UEA binding rather increased in ambient high sodium (by about 21%; Fig. 8, lower graph). This could be explained either by an absolute increase in lectin binding sites or, more likely, by a better accessibility of the core protein binding sites to UEA due to the dramatic heparan sulphate rarefication that occurred within 5 days of sodium overload. Taken together, the data indicate that high-sodium treatment leads to a reduction in eGC heparan sulphate residues. This destabilizes the eGC structure and finally leads to eGC collapse. A sodium assay system was developed to test whether the eGC is able to store sodium in measurable amounts. Human vascular endothelial cells (EAhy-926) were cultured for 1 week under three different conditions, low sodium, high sodium and high sodium + spironolactone. The cells were then exposed to heparinase for 60 min, and, subsequently, the change in sodium concentration in the supernatant was measured. In response to heparinase treatment, endothelial cells cultured in low-sodium medium release about 16 nmol sodium per cm2 into the supernatant (Fig. 9). In contrast, endothelial cells cultured in high sodium do not show any net release of sodium but, surprisingly, increase their content of sodium. Spironolactone prevents this increase. In addition, intracellular sodium was measured in cells, cultured in ambient low sodium and high sodium, before and 20 min after exposure to heparinase. In cells cultured in low-sodium medium, intracellular sodium concentration averaged 13.4 ± 2.33 mM and decreased to 8.8 ± 0.93 mM after heparinase treatment (delta sodium = 4.6 ± 1.51 mM, p < 0.02). In contrast, in cells cultured in high-sodium medium, intracellular sodium concentration averaged 8.8 ± 1.39 mM and increased to 11.6 ± 1.91 mM after heparinase treatment (delta sodium = 2.8 ± 0.89 mM, p < 0.01 ). Taken together, the data indicate that the eGC is a barrier limiting sodium movement between blood and endothelium. The direction of net sodium movement after heparan sulphate depletion depends on the concentration of ambient sodium to which cells were chronically exposed to during culture. The eGC serves important functions in the vascular system . It regulates vascular permeability [34, 37], controls flow- and pressure- induced mechanotransduction of the endothelium  and plays a potentially crucial role in the pathogenesis of inflammation [6, 26]. Chemically, the eGC is an anionic biopolymer with viscoelastic and specific ion-binding properties . Proteoheparan sulphate macromolecules, anchored in the plasma membrane, expose negatively charged glycosaminoglycan side chains with binding sites for inorganic cations. Calcium ions control the conformational structure of the eGC so that sodium ions are preferentially absorbed [2, 33]. There is evidence that sodium may play a key role in the regulation of blood flow and arterial blood pressure. It was shown that small changes in extracellular sodium evoke large increases of systolic blood pressure . The eGC was identified as a blood flow sensor where sodium flux into the endothelial cells was thought to be a crucial trigger mechanism that initiates intracellular signalling . More recently, the eGC was modelled as a mechanotransducer of fluid shear stress involving the fine actin web located underneath the apical plasma membrane [31, 40]. Moreover, it was shown that the “outer shell” of the cell, comprising the eGC, the apical plasma membrane and the cortical actin web underneath the apical cell membrane, is an “ion sensitive zone” . Changes in mechanical stiffness of this outer (apical) cell zone are physiologically relevant since they determine the deformation of the cell surface induced by shear stress and thus the release of nitric oxide, one of the major regulators of vascular tone . In contrast to the fine subapical actin web that determines “local surface elasticity” and thus nitric oxide synthase activity, the coarse actin shear fibres located at the cell basis and anchored to focal adhesions are essential for the alignment in the direction of flow [3, 8]. In the present study, efforts have been made to evaluate the height, stiffness and sodium-binding capacity of the eGC. Stiffness and height were measured in arteries ex vivo in physiological conditions, and sodium storage capacity was estimated in cultured endothelial monolayers. Sodium overload for 5 days hardens and flattens the eGC. This is disadvantageous for humans, since deterioration of the eGC initiates a breakdown of the vascular barrier similar to that in inflammation . Aldosterone sensitizes endothelial cells to high sodium by inserting epithelial sodium channels into the plasma membrane [7, 15, 21] which allows sodium to enter the cells and disturb cellular function . There is an apparent discrepancy between the heparinase-induced eGC damage (stiffness decrease and height decrease, Fig. 4) and eGC damage caused by sodium overload (stiffness increase and height decrease, Fig. 6). In both experiments the glycocalyx obviously collapses (height decrease) due to the lack of heparan sulphates. A possible explanation is that acute heparan sulphate removal (heparinase treatment for 45 min) leads to eGC collapse without any structural reorganisation while sodium overload for 5 days, paralleled by eGC damage, allows some still unknown reorganisation processes (e.g. compacting) of the altered eGC. Gao and Lipowsky  made comparable observations studying post-capillary venules using intravital microscopy. They showed that the removal of heparan sulphate causes a collapse of the glycocalyx most likely due to a breakdown of the fibre matrix. They concluded that the heparan sulphate residues could provide the structural support for the eGC. It is possible that the eGC plays a crucial role as a barrier for sodium, e.g. when the eGC is prominent (∼400 nm thick) and endothelial sodium channel expression is low—a condition most likely achieved in humans with low salt intake—two barriers in series, namely the eGC and the plasma membrane, prevent sodium accessing the endothelial cells. In contrast, when the eGC is virtually collapsed (<200 nm) and the expression of sodium channels is high—a condition to be expected in humans with high salt intake—the two-barrier mechanism increasingly fails and gradually cells may become accessible to sodium. Challenging the eGC with heparinase weakens endothelial barrier function for sodium. After heparinase application, cells cultured in low-sodium medium for 5 days release sodium into the extracellular compartment while, in contrast, cells cultured in high-sodium medium take up sodium from the extracellular fluid. These sodium flux measurements (Fig. 9) are paralleled by mirror-like changes of intracellular sodium. It appears that removal of heparan sulphate from the eGC unmasks sodium shuffle mechanisms between the blood compartment and the endothelium. Although not yet proven, it is likely that, after removal of the glycocalyx, the sodium pump (i.e. the sodium/potassium ATPase) is more active in the low-sodium adapted cells while, in contrast, the passive sodium leak through sodium channels (directed into the cell) dominates in the high-sodium adapted cells. It is tempting to speculate that in the salt-loaded organism, sodium may more easily move from blood into the perivascular space whereby escaping renal filtration and subsequently damaging the whole organism . Sodium abuse is common in many populations worldwide, causing severe health problems. Derived from the present in vitro experiments, it is tempting to speculate that high sodium intake weakens the protective eGC buffer barrier in the human organism. Thus, sodium arriving in the blood after a salty meal more readily exits the vascular system. It distributes in the extracellular space where it binds, osmotically inactive, to negatively charged organic matrices . Thereby, ingested sodium escapes the immediate clearance by the kidneys accumulating over time in the tissue if sodium intake is chronically high. The high sodium content in the body will finally damage the organism . We thank Prof. Hugh de Wardener for the critical reading of the manuscript and Leo Jeggle and Marianne Wilhelmi for helping to develop the ex vivo artery preparation. Work was supported by grants from the Deutsche Forschungsgemeinschaft (OB 63/17-1 and Koselleck-grant OB 63/18).